Our latest project has been taking place in Exeter at The Junipers Psychiatric Intensive Care Unit and Jasmine Lodge Mother and Baby Unit with Devon Partnership NHS Trust. This exhibition is an opportunity to share and discuss the work of Hospital Rooms, the creation of this new work and some of the issues surrounding art and mental health. It will include images of the newly commissioned works alongside original works and preparatory studies made by the artists in relation to the project. Staff and service users are involved throughout the project and interact with the artists through creative workshops and during the installation of commissioned works. Our approach opens dialogue and creates a sense of pride within each unit for patients and staff alike. There will be an opportunity to see examples of artwork made during the artists’ workshops with past and present staff and people who have had care and treatment on mental health wards at Devon Partnership NHS Trust. This will extend to an accompanying exhibition in Exeter Phoenix’s community gallery space The Walkway Gallery (21 May – 23 June 2019). The exhibition coincides with a range of other activity at Exeter Phoenix to mark Mental Health Awareness Week, 13 – 19 May. Join us for a glass of wine and a first chance to see the new exhibition. There will be an opportunity on the night to purchase Hospital Rooms t-shirts (Julian Opie and Gavin Turk), new babygrows (Mark Titchner); tote bags and greetings cards; and limited edition prints by Steve Macleod, Tamsin Relly and Michael O'Reilly. 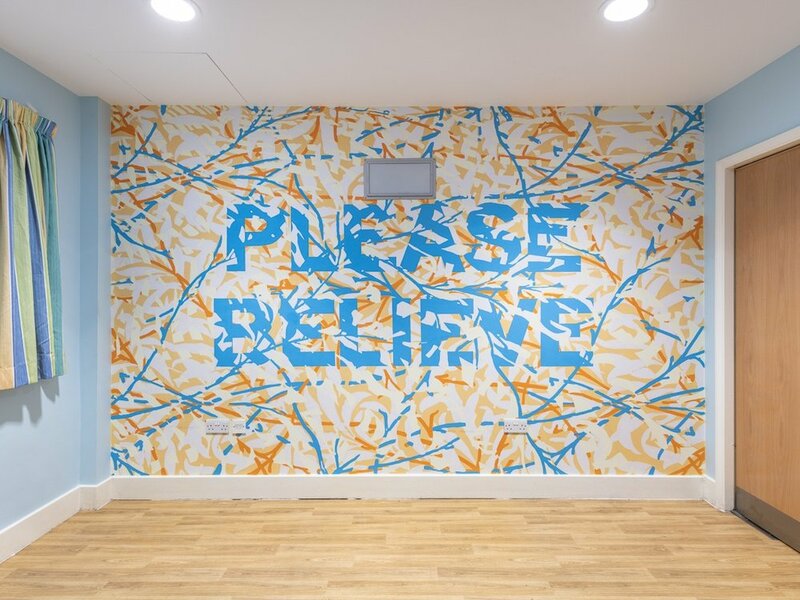 Hospital Rooms artist Mark Titchner will discuss his practice, which focuses on an exploration of words and language ranging from the quasi-mysticism of corporate mission statements to the maxims of revolutionary socialism. Using poems as a starting point, Hospital Rooms artist Susie Hamilton will lead a workshop where you will be able to make your own bold and dynamic paintings, drawings and collages. Hospital Rooms founders Tim Shaw and Niamh White will talk about the charity’s work, past and present projects and the current exhibition. Join Hospital Rooms artist Jon Emmony as he leads a sculpture workshop forming shapes and textures based on the landscape, then 3-D scanning and enhancing them using digital software. Artist Nina Royle will talk about her practice of making paintings on sculpted panels as an expression of landscape, weather, corporality and time and about working with Hospital Rooms in Exeter.